In this issue we learn more about Zack Wells, also known as Lucas Caravaggio. There is a long history for Lucas/Zack that extends beyond the Locke family and there are people still in Lovecraft that know Lucas/Zack. However, Zack is hell-bent on keeping his past and identity a secret because decades before something happened that has impacted a group of friends tied to the Locke family. Also, Bode discovers another key with amazing powers. For me, this was one of the more creative keys in the series and I wish it was in my possession. 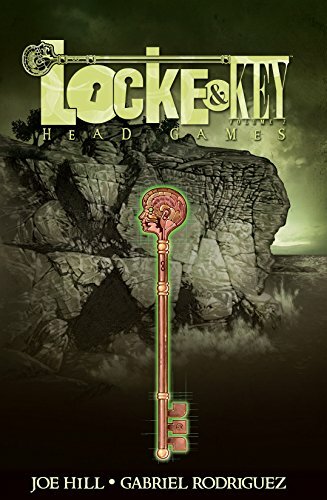 The Head Key allows the possessor to open their mind or someone else’s and will allow not only of the removal of memories but you can add stuff too. For instance, you can open someone’s head, put in a textbook, and there you go, you now know the textbook. While this key plays a large part in the story, especially for Zack who is working diligently to keep his identity and past a secret, this issue begins to build the past of this mysterious and malevolent figure. Elle Whedon is another figure we learn more about and her connection to Zack/Lucas exposes more of the demonic figure’s past. Along with this, we learn more about the Locke children Kinsey, Tyler, and Bode and their struggles in their new town and the tragic events surrounding their father’s death. This compilation of the novels is one that, for me, begins to move the story along a little faster as we see more of the mysteries of Keyhouse and the town of Lovecraft but we begin to see the evil nature of Zack and see he’s moving toward something darker than just hiding his past. This is sure to impact the Locke children and others as well. I think the artwork and the story in this graphic novel are fantastic and it’s a deep story that follows multiple narratives and brings depth to its characters. These characters have a lot of struggles without the keys of Keyhouse being involved but adding to their lives the strangeness that are these powerful keys makes this issue and the ones that follow a fun read, for anyone that likes a bit of horror in their graphic novels.